Standing at the crossroads between Asia and Europe, Azerbaijan is rich in culinary delights that attract thousands of tourists each year. 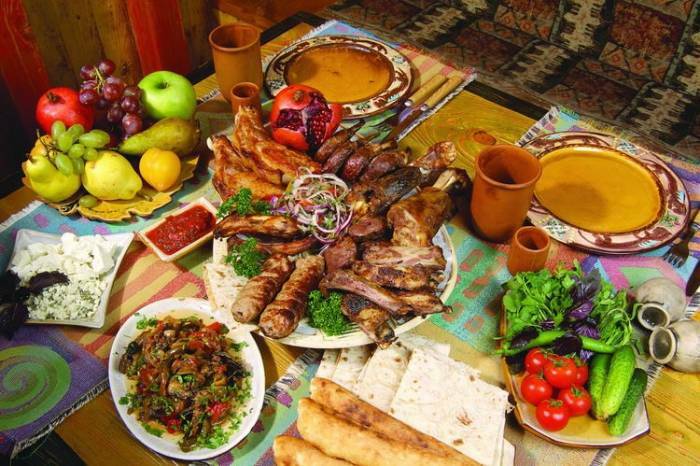 Blending elements from Turkish and Iranian cuisines, Azerbaijani dishes are known for their abundant use of seasonal vegetables and greens, including eggplant, tomatoes, peppers, beets, radishes and cabbage; and meats such as lamb, beef, and chicken. Spices and herbs make all the difference. Mint, coriander, dill, leek, tarragon, marjoram, and thyme are widely used, as well as parsley, chive, watercress and green onion. One of the country’s best-known delicacies is black caviar, sought after worldwide and produced from sturgeon found in the Caspian Sea, which is just east of Azerbaijan and makes seafood an important part of Azerbaijani culinary identity. White sturgeon, Caspian salmon, sardines, grey mullet and a white fish called kutum are all popular amongst seafood lovers. Azerbaijanis take a lot of pride in their food and sense of hospitality, which is usually accompanied by a glass of hot black tea, considered the national beverage. Two-day culinary tours to picturesque regions, like Gabala and Sheki located in the north, are popular with foodies who plan their vacations around exploring new gastronomic experiences. According to the United Nations World Tourism Organization, 80 percent of world travelers design their itineraries around food and culinary events. 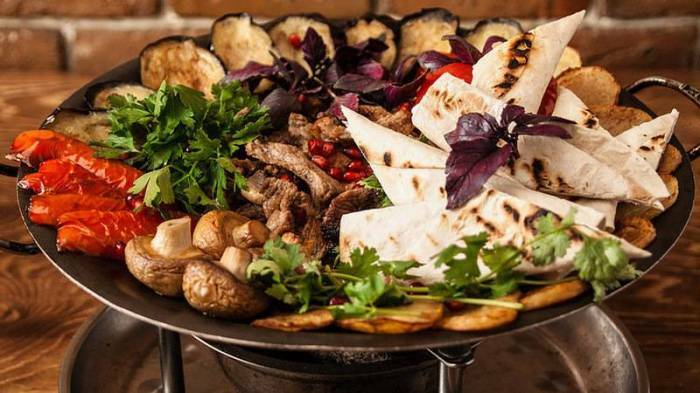 “Visiting Azerbaijanis,” a tourism experience that connects visitors with a resident of Sheki or Baku who will cook national dishes and offer master cooking classes, have become popular in recent years. 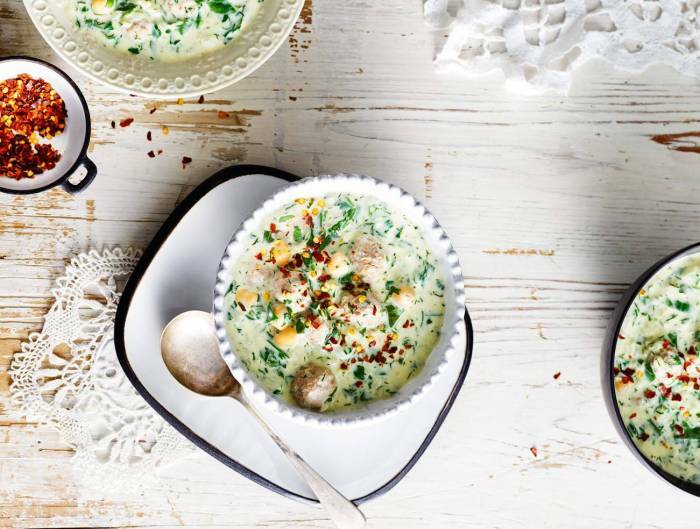 This sour milk soup is made with gatigh, a fermented milk product similar to yogurt, as well as eggs, rice, and herbs including coriander, dill, mint, and spinach. 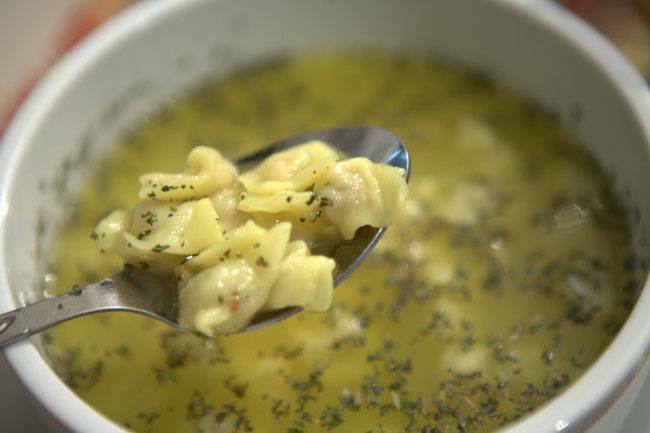 Cooks from Nakhchivan, the Azerbaijani enclave located in the west and surrounded by Armenia, Turkey, and Iran add a twist to dovgha, incorporating small meatballs into the soup. This dish is traditionally served at weddings and other special occasions and has never declined in popularity. One of the best dishes of Azerbaijani cuisine, a sour milk soup known as dovgha is made with gatigh, a fermented milk product similar to yogurt. Khangal should not be confused with khinkali, which are dumplings stuffed with meat and are found in Georgia, another South Caucasus country to Azerbaijan’s west. Both dishes are centered around the use of flour, but there the similarity ends. 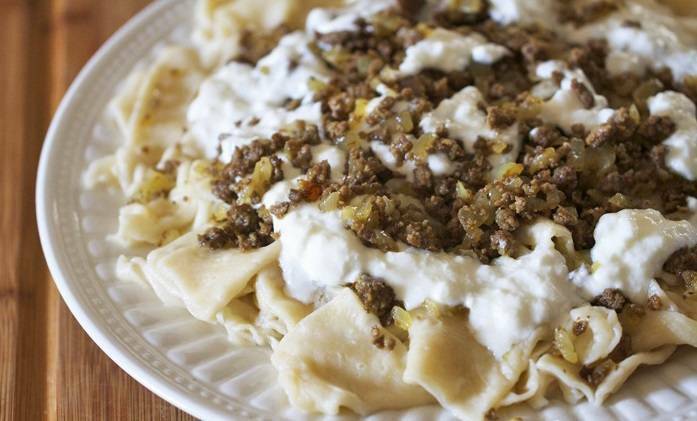 Azerbaijani khangal is made by rolling and cutting the dough into thin, small squares, and then boiled in a meat broth. Served hot and with lamb or chicken, the dish is accompanied by a garlic sauce. When cooking khangal the dough is thinly rolled and cut into small squares and then boiled in a meat broth. Qutab is to Azerbaijanis what pizza is to Italians. Thinly rolled, the unleavened dough is filled with meat, herbs, pumpkin, pomegranate seeds, cheese, onions, and chestnuts, then cooked on a sadj, a flat pan made of cast iron. Similar to gözleme found in Turkey, qutab is eaten with your hands - just don’t forget to roll it up! 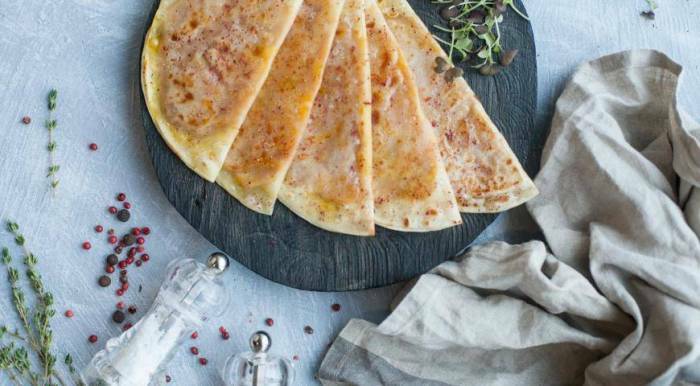 An extremely thin and flat patty with a filling made of unleavened dough, qutab for Azerbaijanis is as pizza or spaghetti for Italians or shaurma for the Turks. A favorite snack amongst Azerbaijanis is lavangi, a stuffed chicken or fish with walnuts, onions and plum paste. The most delicious lavangi are made in a tandir or tandoor, a cylindrical clay oven in which food is cooked on coals. Following the traditions, the most delicious lavangi can came from tandir or tandoor, a cylindrical clay oven where food is being cooked on coals. Piti is not for the rushed and hurried, as it takes between eight and 12 hours to cook. 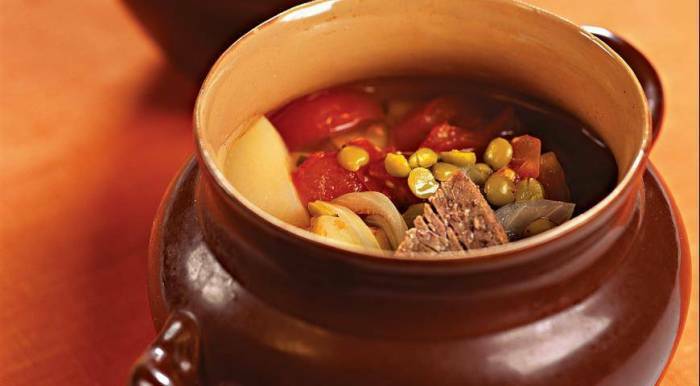 Piti is cooked with lamb, potatoes, peas, onions, garlic, chestnuts and herbs. The ingredients are combined in a small clay pot filled with water and then placed in an oven for a slow cook. Along with dovgha, piti is another popular soup of the Azerbaijani cuisine, but unlike dovgha it is cooked of meat (lamb), potato, peas, herbs, onion, garlic and chestnuts. Considered winter dish, dushbara are a bit like Russian dumplings, but much smaller in size – they say a good cook should fit 12 pieces of dushbara on a spoon! A thinly rolled dough is cut into tiny squares and stuffed with small portions of meat filling. These mini-dumplings are then boiled in water and served with dried mint or a wine vinegar infused with garlic. A truly winter dish, dushbara, is bit like Russian dumplings, but much smaller in size – they say a good cook should fit 12 (!) pieces of dushbara in a spoon. Sadj is actually the name of the pan in which the dish, of the same name, is cooked. Tomatoes, green peppers, and eggplants are perfectly combined with lamb and herbs to make this dish. 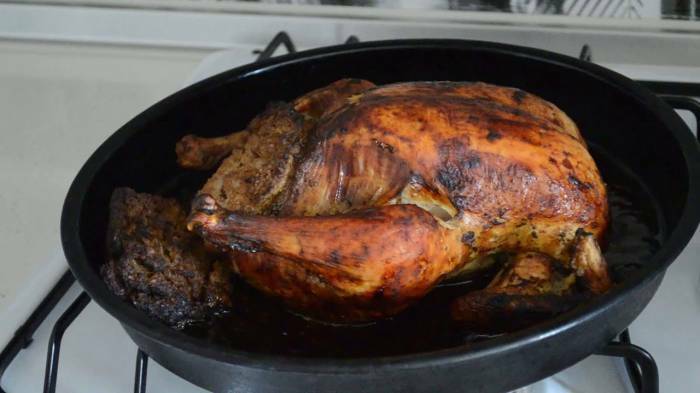 Given that sadj is cooked using tail fat, which congeals quickly, it is served from the stove to the table on the pan, with the coals burning underneath. Given sadj is cooked using tail fat, which freezes quite quickly, it is served directly on the pan with the coals burning under it. When preparing dolma Azerbaijanis use young grape or cabbage leaves, which get filled with minced lamb meat mixed with herbs and spices. Badymdjan dolmasi, a summer version of dolma that is cooked with eggplants, tomatoes and green peppers. Dolma is served with gatigh, a yogurt sauce, mixed with garlic. 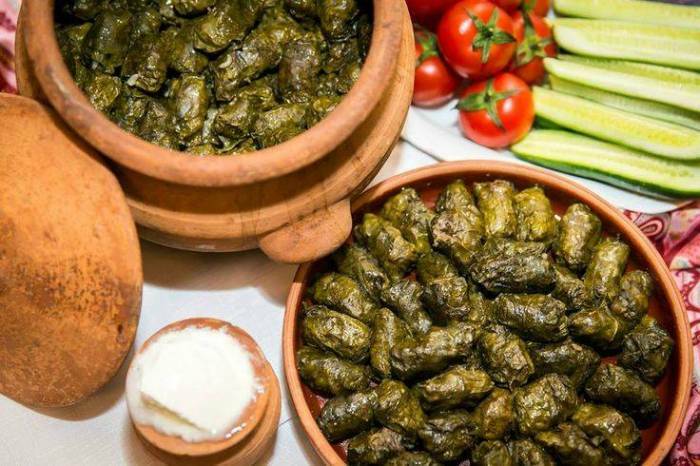 When cooking dolma, Azerbaijanis use young grape or cabbage leaves, which are being filled with minced lamb meat mixed with herbs and spices. If you have visited Azerbaijan and did not try kebab, then you should definitely come back and taste it. There are many variations of this dish: Some are made with lamb or beef, others with chicken or fish. Vegetables like potatoes, eggplant, green peppers, mushrooms, and tomatoes are typically used. 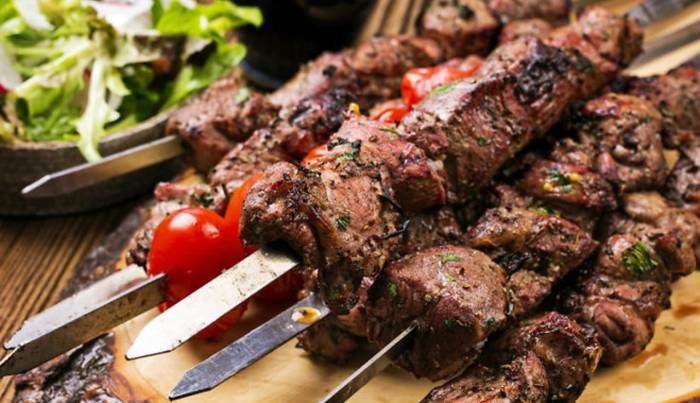 For tika-kebab, usually made with lamb, cubed meat is first marinated before cooking, then threaded onto skewers piece by piece; whereas lula-kebab is prepared using ground meat wrapped around the skewer. There are many kinds of kebab, and some could be cooked of meat, fish, chicken and vegetables, including potatoes, eggplants, green peppers, mushrooms and tomatoes. Pilaf is considered the king of Azerbaijani cuisine. It is an obligatory dish at any wedding or feast, and its varieties number about 200. The distinctive feature of any pilaf is the combination of two constituent parts: boiled basmati rice and gara, a separately cooked sauce. Gara may consist of meat (usually lamb) or fish fried together with onions and dried fruits such as plums, raisins, and cherry plums. The rice, in turn, is boiled and formed into a gazmag, a crust made at the bottom of the saucepan once the rice is cooked, made from dough or potato. Pilaf is normally the final savory course at special occasions like wedding and is served to guests with much ceremony. 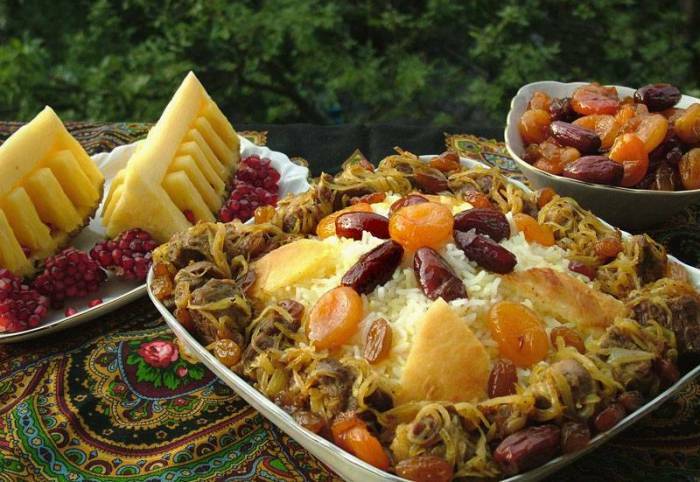 Pilaf is considered the king of the Azerbaijani cuisine as it is an obligatory dish at any wedding and feast. Read the original article on caspianews.com.